Gas discomfort upsets almost every baby to some degree and it affects both breast-fed and bottle-fed babies. While gas pain is common and can afflict a child at any age, it is particularly bothersome in newborns and young infants between one and four months of age, as their immature guts are developing. Furthermore, some babies seem to suffer more than others due to inborn and environmental factors. Pockets of trapped gas act like corks in the digestive system, causing painful pressure points to build up in the affected areas. Incorrect Feeding Technique: a poor latch onto the breast or bottle results in too much air being swallowed at meal times. Crying: It can cause your baby to swallow air, especially if he/she cries in hunger for a long period before a meal. Since crying is both a symptom and a cause of gas, it can create a self-reinforcing cycle that worsens the problem. Immature Digestion: A newborns gut is continuing to develop after he/she is born. The gut may still be learning to process food, gas and stool effectively. Gas may also be present in the gut which may also be a symptom of constipation. Food sensitivities and Allergies: If you suspect a food sensitivity or intolerance, try keeping a food journal to track symptoms like gas, spit-up or fussiness. Overfeeding: This can cause problems if a baby’s tummy cant cope with too much food at once. Feeding too fast may produce lactose overload and increased intestinal gas from the breakdown of excessive lactose. Introduction of New Foods: New foods can make a baby gassy as his gut learns to process them. An excess of high sugar foods like juices can also cause a baby to have looser stools or gas. Relief may come with a bowel movement or passage of gas. Rocking the baby and singing to him may be helpful. Feed the baby in a sitting position, and burp him after each ounce of fluid. Massaging the baby’s tummy may also help, especially combined with rectal stimulation. Another way to soothe a colicky baby is to hold the baby face down, head toward your palm, tummy on your forearm, and legs straddling your arm. Use your other arm to pat the baby on the back or hold him securely while you walk with him. Pressure on the abdomen seems to relieve gas cramps. Be cautious with herbal remedies. Although there are some who recommend chamomile, fennel and others, there is little evidence that colic is cured with these treatments. Try to avoid using gripe water, unless recommended specifically by the pediatrician, because there are often unregulated ingredients (alcohol, etc.) that may be harmful to the infant. Chamomilla : Children who are oversensitive to pain, moaning restlessness and are irritable. Impatient children who do not know what they want and quiet only when carried. Colocynth : Agonizing pain in abdomen which is better by bending double with restlessness. Pain better by hard pressure on the stomach. Discoreo Villosa : Gases after meals causing pain around umbilicus region. Violent twisting pain which increases after bending . Pain better by standing or bending backwards. Pulsatilla: Pains are rapidly shifting from one part to another . Child is thirstless and wants to be covered all the time. 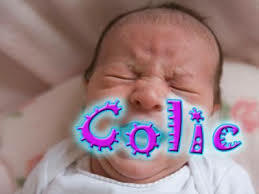 Some other Homoeopathic Medicines that can be thought of Colic are Belladona, Opium, Veratrum Alb, Platina, Plumbum.